UNRELATED INTRO: I’m finding it increasingly amusing to document my own run-ins with various marketing tactics, and I hope that you find it interesting as well. I can’t help but laugh at myself every time I realize I’ve “fallen victim” to a marketing ploy. I feel that the least I can do is to share my experiences to prove that I’m fully aware that I’m a sucker. Anyway, on to the reason you’re here. It was a Monday in mid-May, the sun was high and bright, and the hunger? It was real. I was on my lunch break, running errands with good intentions of securing a healthy lunch at a local Herbalife shake shop (that I’ve just so happened to have written about previously). Suddenly, my phone chimed. I continued on with my errands. After stopping at a fabric store to pick up a blue-jean button (since one of mine had fallen off, not at all related to my desire to eat healthier, okay, stop questioning me, whatever), I made my way to the shake shop. Upon walking up, I realized devastation: UNDER CONSTRUCTION. read the sign. No delicious, healthy shake for me today. I weighed my other healthier options in town. Subway? Wasn’t really in the mood for a cheeseless, mayoless, soulless sandwich. Panera? Too far away to drive. Fast-food salad option? Not feelin’ wilted lettuce & soggy tomatoes today. Say screw it and get a burger somewhere? NO WAY I’M A GROWN WOMAN ON A DIET, HELLOOOO. Needless to say, decision = made. 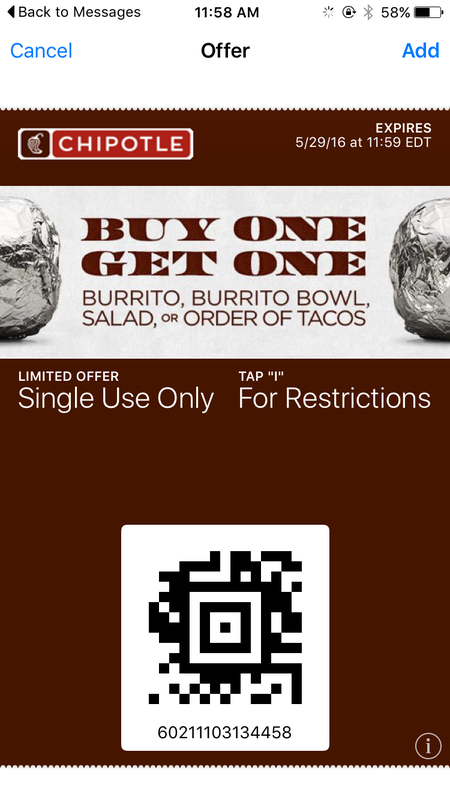 Had I not just received that SMS coupon at the absolute perfect time, would I still have gone to Chipotle? Hard to say, but I’m guessing probably not. Fortunately, Chipotle had the healthier options I was looking for, too, otherwise I may have chosen elsewhere given my goals for the day. 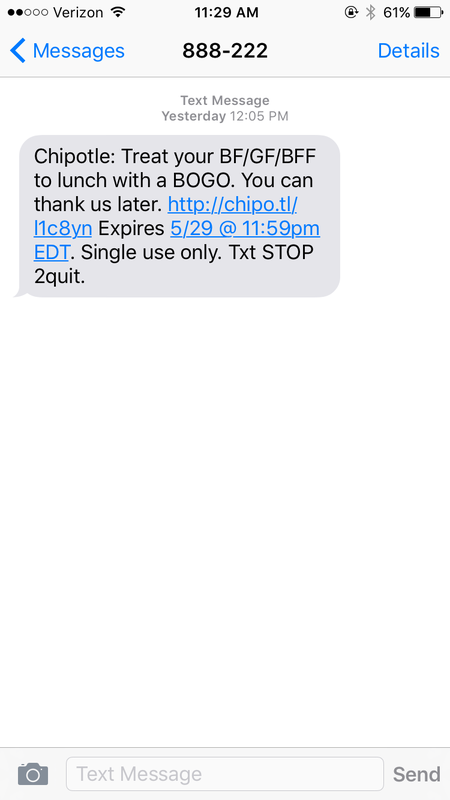 But the text was an absolute win for Chipotle (thanks to great timing & great understanding of their audience) and really an absolute win for me and my lack of hungry friends. Thank goodness for that. SMS marketing is most effective when you know your audience, understand their expectations, and know what kind of incentives to offer. Chipotle did just that, and it earned them a $7.04 transaction and a very satisfied customer. 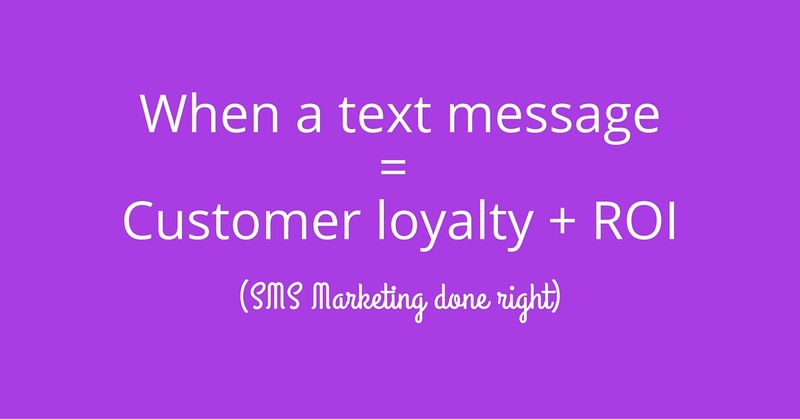 Want to delve deeper into SMS marketing and find out if it’s a good fit for your business? Here are a few good reads from my favorite blog, Convince & Convert, otherwise feel free to reach out to me and we can chat about it some more!